In New Zealand there is departure fee, but in Argentina you need to pay an entry fee (so called “Reciprocity Fee”) which you must be paid in advance. From December, 2012 this fee is applicable not only at airports, but also at all land border crossings and ports. Only passengers arriving on cruise ships are exempt. This fee is payable only by Australians, Canadians and US citizens and it is not a visa fee since Argentina does not require visa to nationals of these countries when traveling for tourism. Argentine Government set this reciprocity fee on equal amounts to those Argentinians must pay when requesting a visa to travel to Australia, Canada and US. 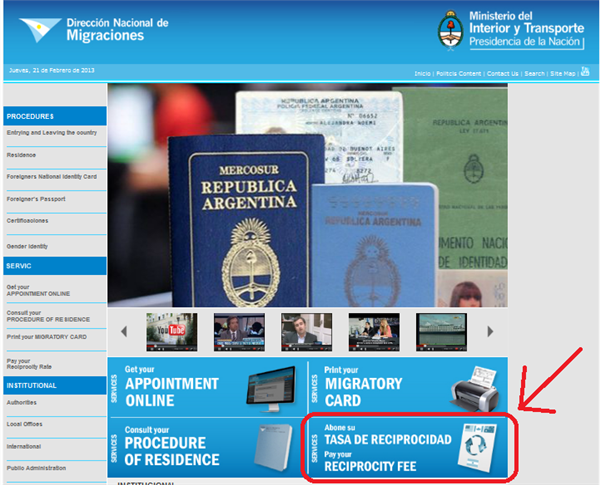 Go to Argentine Migration website to pay this fee. Australia: US$100 valid for for multiple re-entries within a period of one year as of the date of first entry. Canada: US$75 valid for one entry and re-entries from bordering countries within 3 months.